>I’ve been thinking about prayer today. Maybe because of what happened yesterday. I lost my cell phone and mentioned my plight on my Facebook page. Several friends responded with good advice about reporting it, getting a replacement, etc. I ordered a replacement phone at 5 p.m. Monday and it arrived at 1 p.m. Tuesday! With only a $50 deductible, I’ve got a brand new Blackberry Pearl just like the one that was lost/stolen. So, when I realized it was missing, I immediately made the sign of the cross and said, “Lord help me.” Then I proceeded to ask people for help. My daughter had the quickest most practical advice. But when I looked at my Facebook status, I noticed more than one of my Orthodox friends said to pray to St. Phanourios. I think it’s a practice I’ve developed as an Orthodox Christian which differs greatly from my prayer life as a Protestant. As a child growing up in the Presbyterian Church, I memorized the Lord’s Prayer, but it was really the only liturgical prayer I remember being taught. During my teen years, I was involved in Bible study groups and youth groups in various churches, and I was introduced to “spontaneous” prayer, a practice which I continued into my college years, even writing some of them down in notebooks. So why did this St. Phanourios thing trip me up yesterday? He’s one of many saints that Orthodox Christians have traditionally prayed to for help with specific needs for generations. And yet, somehow this tradition harks back to the Protestant tradition of asking for specific things when you pray. Or at least that’s the way I remember it. Like, “Please help me make an A on this test,” or “Please let so-and-so (a boy) love me back.” When I have a headache, I don’t usually pray to St. John the Baptist to cure it. Instead, I usually take two Tylenol and try to take a break from the computer or the heat or whatever activity I’m doing. And yes, sometimes I say, “Lord, have mercy,” and I cross myself. Of course Christians from both Eastern and Western traditions embrace the Lord’s Prayer, but I wonder if we “interpret” it differently? The only place in this prayer where we ask for something that could be interpreted as a physical need is when we say, “give us this day our daily bread.” But some Orthodox saints explain that part of the prayer as us asking for something spiritual. Other theologians say that the prayer can mean both, give us our spiritual bread, which is Christ, but also our physical bread, which can mean food, clothes, houses, cell phones…. I love how we say, “Lord, have mercy” about a hundred times during the Divine Liturgy in the Orthodox Church, because that’s what we always need—mercy. And truthfully, we don’t always know what’s best for us, but God does. My spiritual father has a saying that I love: “Pray and do the right thing.” It’s synergistic—us working together with God. Maybe that’s what I’m trying to learn. Good thing we’ve got a lifetime here on earth to practice. my husband’s thorough research in Consumer Reports, where he found this Nordic Track AudioStrider 990 (on sale at Sears for 2 more days: $899!) 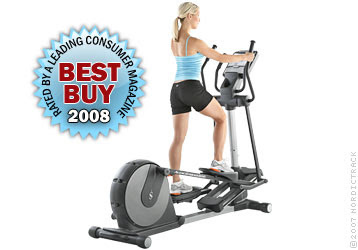 Although I was pretty sure this was the machine I wanted, I took my time, trying out several other floor models, and feeling good about the fact that the one rated so highly by CR was the one I liked the best—it had a nice long stride not a very high step, like the stair-masters have. (I’ve got bad knees.) As I went round and round on the machine, eager to have one delivered at home so I can try (again) to get back in shape (and yes, my 40th high school reunion is in one month!) I imagined the TV shows I could watch at home to help the boredom. But I also imagined the time it would allow for thinking. Round and round the wheel goes…. Round and round my mind goes. Would I write about my spiritual journey, the insane years I spent in a cult-like group en route to finding my home in the Orthodox Church? Sometimes I think about that song, “Rock and roll, I gave you all the best years of my life,” and that’s how I feel about religion—that I gave it all the best years of my life. (Actually, this might be a better video.) And now my church is in trouble and there’s talk of removing a bishop (which I agree needs to happen). 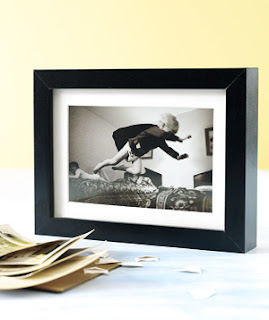 If I could, would I go back and live differently for the first 17 years of my marriage, when we were on a crazy search for a church home, or even for the past 20 years in the Orthodox Church that we finally joined in 1987? Some of my friends who shared this tumultuous journey with me have said, “I’d do it again” or “It was worth it” because we finally found our spiritual home. I agree that it was worth it, but would I do it again? What would I do if I could go back to 1970 and decide whether to leave the conservative Presbyterian Church and easy lifestyle of my upbringing to hang out with a rag-tag band of radical Jesus Freaks? I know one thing I would change. I would stand up to the narcissist leaders who cropped up along the way. But wait—could I really have done that? By their very nature, narcissists get a grip of control on their followers that’s really hard to shake. They build fear and a sick kind of commitment that often prevents good people from speaking up. Even now dozens of Orthodox priests are living in fear of their metropolitan’s power-hungry ways. And these are some smart, strong, godly men. Some of them have already stepped up and risked their futures. It’s going to get messy before it’s all over, but I can only hope and pray that none of them will look back at their actions this summer and wish they had done something different. You know, I probably won’t enter the WD writing contest. Just thinking about it stirs me up too much. Why think about “what might have been”? It’s such a waste of emotional energy, for one thing. And we can’t change the past. We can only learn from it and move forward with courage and humility. >I thought I had heard all the latest nouns-turned-verbs/adjectives when I joined the world of Twitter. Boy was I wrong. Last night I started reading the July/August issue of Poets & Writers Magazine and there it was, on page 18—a new multi-speech-part word: “flarf.” Sounds like preadolescent male bathroom humor, but it’s really a new literary term, created about ten years ago by a group of people who knew how to write poetry but were searching for a new, entertaining art form. According to the story, “Can Flarf Ever Be Taken Seriously?” by Shell Fischer, flarfers do random word-searches on the net, email the results to each other, and use the phrases to create poems called “flarfs.” Since their inception, “flarfy” music, theater and film have been born, and in November, Edge Books will publish Flarf: An Anthology of Flarf, which will feature the work of 25-30 poets. 1. Heroes don’t always know that they’re heroes. 2. Herosim is a lonely, thankless vocation. 3. When the going gets tough, the usual rules don’t apply. 5. You can’t trust anyone. 6. There is always someone you can trust. 7. There is always enough time. 8. You should never get too comfortable. 9. Everything will be OK in the end. 10. There is always a sequel. Read the (one-page) article to get Scott’s full wisdom on each of these tenets of heroism. My personal favorites are Number 4: It’s always personal and No. 10: There is always a sequel. After you read them, please share your thoughts—leave me a comment, about heroes, flarfing, or whatever your take on doing your Personal Best. >Who Loves Christ? I Need a Hero! Saint John of Damascus tells us that the people who “love Christ,” and who are “children of the Church” will never cause confusion, but will work for peace within the Holy Catholic and Apostolic Church of God. لان الله ليس اله تشويش بل اله سلام. كما في جميع كنائس القديسين. So I guess this begs the question, “Who loves Christ?” And don’t we want our leaders—those who are responsible for protecting Christ’s Church—to be people who actually love Christ? Or again, if you prefer the Arabic: لا يقدر احد ان يخدم سيدين. لانه اما ان يبغض الواحد ويحب الآخر او يلازم الواحد ويحتقر الآخر. لا تقدرون ان تخدموا الله والمال. >I haven’t been able to quit thinking about the conversation I had with the mother of young children, the one I posted about last Tuesday. I think it’s because I’ve just spent lots of time on the phone trying to straighten out some of my mother’s business affairs—I’m her Durable Power of Attorney since she has Alzheimer’s—and at the end of the day, it can be just as trying as teenagers, toddlers and newborns. Only without the joys to be had from those precious teenagers, toddlers and newborns! 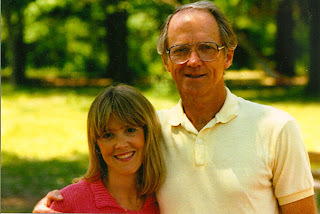 Please believe that I’m not writing this to complain, but rather to share some of the ins-and-outs of being a full time daughter of a parent with Alzheimer’s. Okay right away I can hear some of ya’ll thinking, “She’s not full-time—her mother doesn’t live with her. In fact, she doesn’t even live in the same city!” And you would be correct on the second two points, but completely wrong on the first one. There is not a day, and some days not an hour, that goes by in which I don’t think/worry about my mother and how she’s doing. And between visits (usually every 2-3 weeks) I’m taking care of her business from home. Sometimes it’s unbelievably complicated. I’ll share a couple of stories. When I moved Mother into an assisted living home in February of 2006, I spent the next three months cleaning out her house and selling it. (Thank God it was before the current financial recession!) One friend helped me go through everything my parents had collected in their 49 years of marriage. The job pretty much consumed my life for all of spring of 2006. 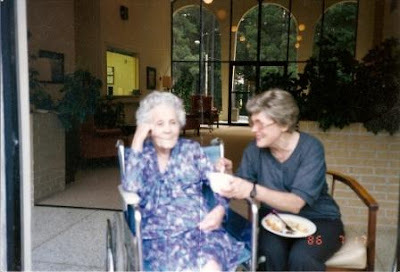 Once we moved her into her assisted living apartment, hung all the pictures on the wall and got her cable TV, telephone, and newspaper subscriptions transferred, she was good to go for a few years. She had made me Durable Power of Attorney and put my name on all her financial accounts while she could still think clearly, which helped tremendously. (I can’t recommend this strongly enough for anyone caring for elderly parents.) I had already been filing Mom’s income taxes for a few years (Dad died in 1998) but when she moved in assisted living I had all her business mail sent to me and I began paying all her bills for her. That last one is one of the “stories” I want to share. We enrolled Mom in Humana three years ago, with me being Durable Power of Attorney, so all the paperwork came to me here in Memphis. No problem. But in January when we decided to change her to AARP, I asked for help from a friend of my father’s in Jackson, because his daughter handles those kinds of things for his business. She got it set up, and after a while (yes, I should have been paying closer attention and I would have caught it sooner) that the statements were being mailed to Mom at the nursing home. I would find them in her trash can or in a stack of greeting cards, often unopened. So, I called the company to asks them to please mail them to me. Turns out they never got my Durable Power of Attorney back in January, so I had to fax it to them, and call them 3 times over the next 10 days to see if they had attached the DPA to her file yet, before they would even talk with me. Finally I was “in” and I asked them to change her mailing address to my address in Memphis. I was told they couldn’t do that because she lived in a different state. After several attempts to talk with a manager, I finally got one, who agreed to put my address as the “secondary” mailing address, which means I would get a copy of all correspondence, but so would Mom. Even when I explained that she has Alzheimer’s and doesn’t remember how to open an envelope, that the aids have to open her cards for her. Of course I said, “ I didn’t have this problem with Humana,” and they said, “Well, this is a policy of Medicare Part D, so Humana should have been following it.” Who makes these rules? Is it expected that everyone will live in the same state as their elderly parents? And then there’s Comcast Cable. 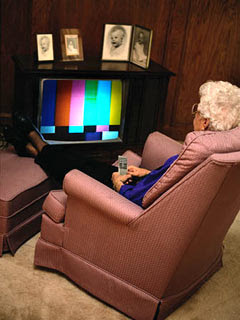 When I got the cable guy to set up Mom’s tv in her room in the second nursing home, he gave us a “deal” of $34.35/month. He didn’t say it was only a promotional offer. But after 2 months the bill went up to $62.65/month, saying the “promotional offer” had ended. Mom barely even watches tv anymore, but I don’t want to take it out of her room just yet because sometimes it’s good company for her. So today I called Comcast. I called the 1-800 number on the bill and when I finally got a human voice, she told me that she could only help me if the television was in Memphis. I said, “But why is this 1-800 number on Mom’s bill, if she lives in Jackson?” Turns out it’s because I live in Memphis, and the bills come to me. So she gave me a 1-877 number to call for Mom’s zip code in Jackson. I’ve tried it several times today and it’s always busy. They’re “open” 24/7, so maybe I’ll try later tonight. But what irony, that living out of state penalizes me with both AARP and Comcast. I could tell more stories, but I think you get the picture. Fortunately the folks at her nursing home are great. I get phone calls from nurses and social workers with updates between my visits, and when they hold their regular “care team meetings,” they put me on speaker phone so I can talk with everyone at the meeting—nurse, social worker, dietician, activities director, physical therapist, etc. And when I drive down to visit Mom, I always check in with the nurse and director of social services for the latest updates, or to express any concerns I have. They tell me that people from Mom’s church visit her, as well as other folks. That comforts me. If I move Mom to Memphis, she doesn’t know anyone but me. I’m pretty determined to make this long-distance care giving work. 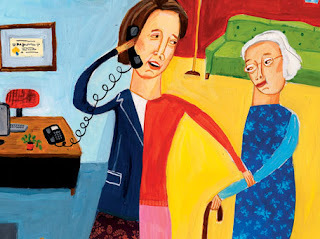 If you’re caring for an elderly parent—locally or long-distance—I’d love to hear your stories. Leave a comment, for me and others. Meanwhile, drink lots of water and stay out of the sun! >Today I want to salute a couple of dads who are dear to my heart. 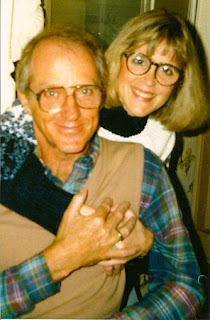 First, my own father, Bill Johnson, who died at age 68 of lung cancer, on July 9, 1998. Dad was a marathon runner, owner of Bill Johnson’s Phidippides Sports in Jackson, Mississippi from 1982-1997. He was known as the “guru of running” in Mississippi. You can learn more about that part of his life here. I remember family vacations, following Dad around various golf courses, watching him compete in tournaments. It wasn’t the beach, but the swimming pools and golf cart rides weren’t so bad. 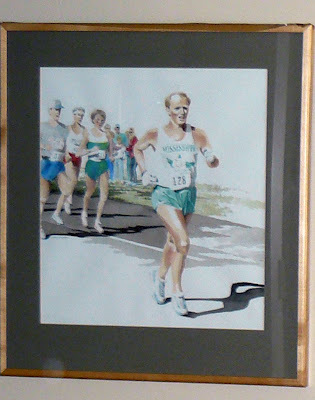 This is a (poor) photograph of a watercolor of Dad running in the Mississippi Marathon one year. The second father I want to salute today is my son, Jason. Jason and his wife, See, are expecting their first child—Grace Mahlia—in about a month. Here’s Jason assembling Grace’s crib in their apartment in Denver. I laughed when See sent me the pictures, imagining many more things that Jason will have to assemble in years to come. So today is Jason’s first Father’s Day! Next year maybe Grace will be calling him Daddy! >Yes, we can read. 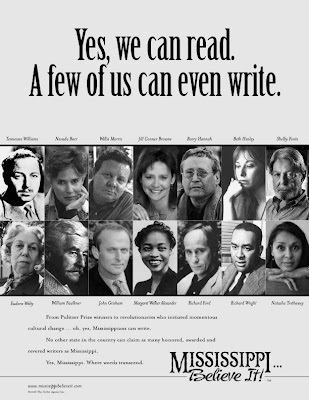 A few of us can even write. Every time I drive down I-55 from Memphis to Jackson to visit my mother, I am bothered by this billboard just north of Jackson that says, “Our Children Can’t Read—We Are All Losers.” I keep meaning to take a picture of it, but I’ve never taken the time to stop and get out of the car on the interstate to snap it. So, I Googled it today and found this photo on a blog written by folks who researched the source of the billboard and discovered that it was “the result of a citizen group from Tupelo, MS that is advocating use of the Orton-Gillingham method of instruction, a method of teaching reading to dyslexic students that has been in use in some form since the 1930s. So, this billboard is arguing that reading levels are so bad in MS, that a special-needs-student approach is warranted, generally.” Now I’m not an educator and I have no idea whether or not this method would be a helpful approach for students who are struggling with reading, but that’s not the point. The point is the billboard is offensive. Be more concrete—like O’Connor and Hemingway. He felt that my story was too melodramatic, too forced. I got his point, but let me just say there was a lot of testosterone in the room when the critiquing was going on! There were lots of great specifics offered about each of our writing samples, and I’m sure we’ll all be back! I can’t go next Thursday, but plan to return on July 2… with an essay in hand next time! Remember, if you’d like to go, send me an email and I’ll get you in touch with Barry’s people! Meanwhile, have a great weekend! >All my stories are about the action of grace on a character who is not very willing to support it, but most people think of these stories as hard, hopeless and brutal. I had a conversation with a friend the other day that got me thinking about the action of grace in our lives. She has young children, and like so many mothers at that stage, she struggles not to live in a constant state of over-scheduled stress. 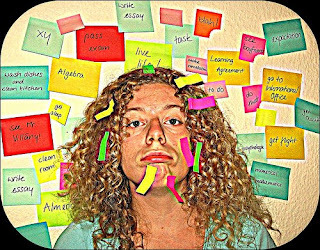 Trying to balance work, home, children’s activities, and maintain a sense of joy in the process has become quite a juggling act. Back when mothers stayed home and took care of the house, with her daughters helping her while her sons were out in the fields or hunting with their fathers, roles were more one-dimensional. We have to fight to find that natural rhythm and joy in the everyday of our multi-dimensional lives. Later that same day, I found myself looking at my “To Do” list for the week, and I realized how much I considered each item just that—something “to do”—rather than an opportunity for God’s grace to act in my life. So I decided to try to slow down my approach this week, and to find joy and peace in the “doing.” By going “inside” to find the peace, and then asking God’s grace on all that I do, I’m finding that I can actually enjoy each activity more, rather than hurrying through it to “get it done.” Well, maybe I’m not enjoying repetitive phone calls to doctor’s offices to finally get a prescription refilled. And no, it’s not exactly enjoyable straightening out errors on a cell phone bill or cleaning out junky guest rooms when visitors are coming. But when I try to focus on the joy the visitors will bring, and the blessing of having a cell phone, and the relief the prescription medicine brings, it changes the process, by God’s grace. Wow. God truly gives us what we need through His saints! It is not circumstances that darken our souls…. How often I have heard people say, ‘…what can I do with such a son-in-law, my rheumatism, or the Russian revolution? You want happiness—give an equal measure of happiness; you want freedom—give freedom in exactly the same measure. You want food—give food; you want love, unselfish and thoughtful—give unselfish and thoughtful love. These last words of Met. Anthony’s speak directly to our everyday stresses: whether we’re dealing with our children, our customers, the person on the other end of our phone calls to insurance companies, doctors’ offices, or cell phone businesses, or the stranger asking for food or money on the street corner, we can find happiness, freedom, and satisfaction to the measure that we are willing to give it to others throughout each day. How amazing that this wisdom from an Orthodox Russian archbishop so parallels the words of a Southern Catholic writer. May God help us be willing to support the action of His grace in our lives. P.S. And yes, I LOVE my new MacBook Pro! This is my first post after a 3-day weekend of setting it up, transferring stuff from my old PC, and beginning to learn how to use it. My daughter has done most of this for/with me, of course. And sure, some of it has been difficult or frustrating, but I’m trying to enjoy the process because I am so thankful for my new Mac! >The Big Switch… to Mac Book Pro! >It’s June 13th, so you know what that means. Television land went digital yesterday. Big switch for lots of folks. Not such a big deal for others. But it’s also our 39th wedding anniversary, which is a big deal any way you look at it! So, what am I doing to celebrate? Well, today I’m going shopping for a Mac Book Pro, so I’ll be making a big switch of my own. This will, hopefully, be my last blog post on a PC. Now that may not sound very romantic to some folks, but I’ve been wanting a Mac for years. Our daughter is home from grad school this summer, and she uses a Mac, so she’s going with me to the Apple Store. Last night we took her with us to Ruth Chris Steak House for our anniversary eve dinner. Oh, and you can read about last year’s anniversary celebration and see photos here, including old photos from our wedding and honeymoon!. We toasted with champagne before our delicoius steaks and sides arrived. And yes, we finished off with creme brulee, ice cream, and for me, a frozen Brandy Alexander. Cushmans know how to celebrate! Earlier in the day I arrived home from errands to find these gorgeous red roses on the kitchen table from my husband. They’re in the vase that was given to us by Urania Allisandratos before she died a couple of years ago. She said that her husband, Andy, had given her the vase on their first wedding anniversary (and they had 59 anniversaries) and had brought her flowers for it every year after. She pretty much told my husband that he had big shoes to fill. Aren’t they beautiful? It was fun to play around with close-ups of the blooms. 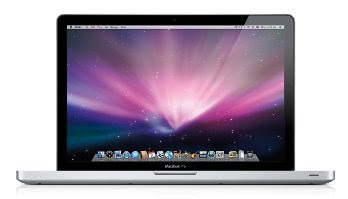 Hope it will be as much fun to play around with my new Mac Book Pro. I was reading an article in AARP the Magazine, which was trying to help seniors get ready for the Big Switch to digital television. It reminded me how much harder it is for my brain to adjust to new things as I get older. Suddenly I worried about whether or not my mother’s television at her nursing home was “ready,” and then I remembered she’s got cable. So, I’m off to the Apple Store! Hope I’ll be functioning on my new Mac Book Pro in time for another post by Monday. In the meanwhile, I’m going to try to bask in the joy of today, my 39th wedding anniversary. Wow. And another countdown begins: 6 weeks until my 40th high school reunion at Murrah High School in Jackson, Mississippi, just a week or so after my first grandchild is due! A summer of big celebrations. Oh, and I would be remiss not to send a shout out to our dear friends, Father Paul and Sissy Yerger, who are also celebrating their (38th) wedding anniversary today! We didn’t know the Yergers when we got married, but our friendship has blossomed over the years, and we shared a wonderful 12 day trip to Greece with them in October of 2007. Here they are on a boat ride to the island of Aegina. Many years, dear friends! 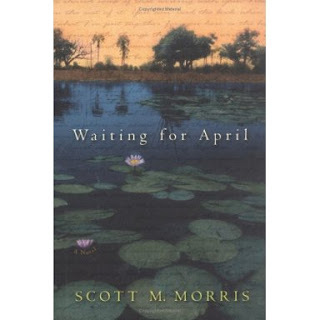 Every year I wonder what new literary delights Scott Morris will bring to the table at the Yoknapatawpha Summer Writers Workshop in Oxford, Mississippi. 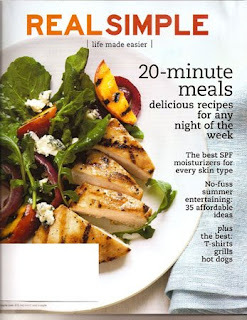 And what erudite morsels Neal Walsh will serve up throughout the weekend. Can they possibly top last year’s feast? After returning home to Memphis on Sunday, I decided to give myself a few days to digest the early summer repast before writing about it—maybe to even savor the tasty remnants that got stuck in my teeth and allow them to remind me of nuanced tidbits I might have otherwise forgotten to mention. Like fishermen who are passionate about catching the wide-mouth bass, we are tempted to rely on plastic lures—on existential shorthand—to get the job done. But everything important and vital escapes with shorthand. Genre writers traffic in the existential shorthand, but is it really an effective way of summing up your life? 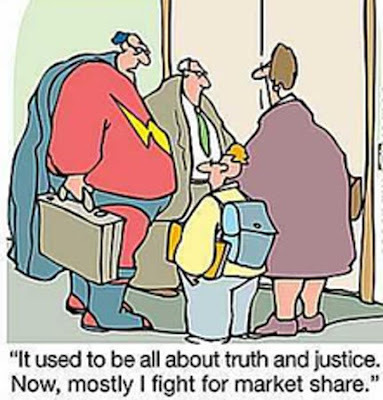 Is it a fair representation of what you are? Because, after all, writers are just like fishermen, and the “bass” they are after is nothing less than the human heart. The writer’s cross, then, is to combine the judgment and wisdom of the sage with the heart of the child. There is no suitable shorthand for the morning moon. You don’t have to be an artist—you just have to be fully human. Story is more than a few anecdotes and interesting experiences. All great books have a clear beginning, middle and end. While that may sound elementary, you’d be surprised how many folks sit down to write and end up with a string of unrelated events. Stories should draw people into a better world and allow the reader to be interactive with the work. Show the characters through dialogue and scenes (“show, don’t tell”) and keep the writer out of the story. One thing that made Bess’s time with us so valuable is that she was a successful literary agent but is currently out of the business. So, we were free to talk with her without the tension of wanting to pitch our writing to her, and she was free to share her wisdom without the filter of protecting the business or the distraction of watching for new clients. 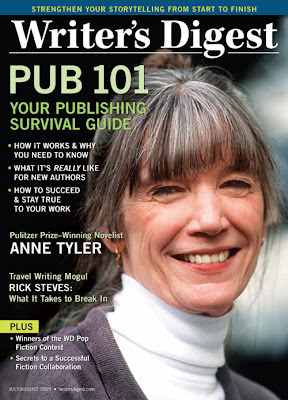 She addressed our questions—even the most simplistic “publishing 101” kind—without condescension, and with clarity. And she was just delightfully upbeat and seemed to genuinely care about helping good writers get published. What a treat she was—the dessert in our literary picnic! On a personal note, a huge take-home from the workshop for me is the confirmation—from faculty and fellow participants—that the essay I submitted for the workshop needs to be expanded to book-length. Although I’ve been working on another book for the past year and a half, I’ve been “stuck” in an emotional struggle over some of its content, and it feels good to hold off on it for a while. (Or just write it as “therapy” without any “watchers.”) So… I’m off and running with an outline for a new memoir: Jesus Freaks, Belly Dancers and Nuns. An essay with the same title will appear as a chapter in an anthology on Southern women and spirituality in the fall of 2010, so hopefully I’ll have the book finished by then and ready to pitch to agents and publishers. I learned a lot about patience and endurance listening to Neal, Ace and Scott as they served on a panel this weekend, “Getting Published: The Writer’s Side of the Story,” so I hope I remember their lessons when the time comes! Oh, I would be remiss not to mention how much I enjoyed Rebecca Jernigan’s storytelling, reading and performance again this year. She even pulled workshop participant Michael Risley into the act, which was quite a coup given Michael’s prosecuting attorney persona! And listening to Neal, Ace and Scott read from their own published works was also a treat. Neal’s first book, THE PROSPECT OF MAGIC won the 2009 Tartt’s First Fiction Prize and is due out in hard and paperback by Livingston Press in June of 2010; Scott has two published books, The Total View of Taftly and Waiting for April, and is shopping his third one around for publication now; and Ace, as I said earlier, has 7 published, and 8th finished, and the next one in progress. 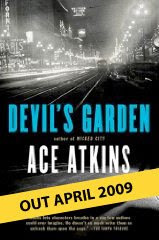 His most recent book is Devil’s Garden. Open mic was fun both nights, as we listened to each other’s short pieces without an ear to critique but for the pure, unadulterated joy of hearing the written word spoken aloud in the author’s voice. The reading that captured my attention the most was probably Patti Brummett’s. Patti is 18 years old, a recent high school graduate and entering freshman at the University of Mississippi. Her writing sample for the workshop was an amazing piece of prose-poetry, or lyrical prose, or some indefinable genre which Patti simply calls “fiction.” So it shouldn’t have come as a surprise that her offering at open mic was a performance in a genre akin to Da-da poetry. It reminded me of a cross between slam poetry and rap, with a soft edge, if that makes sense. It was great to meet the “new guys” at this year’s workshop, including Anne Burgan, Martha Carole Jones, Dan Stringfellow, Patti Brummett, and to be joined by my niece, Aubrey Leigh Goodwin! (That’s Aubrey and me on the balcony at City Grocery.) Aubrey is a lawyer, but she’s always been a writer, and of course I love watching her jump into this exciting world of creative writing and publishing. The faculty this weekend confirmed what I already knew—she’s on her way! It was also great to be with the repeaters (some of us for the 3rd year) like Doug McLain, Herman King, Michael Risley and Daphne Davenport. Oh, and kudos to Herman (left) who lost his virginity this month (his words, not mine)—Herman’s piece, “Southern Intrusions” was published in the June issue of Desoto magazine. You know what that means? Herman has to buy drinks at our next get-together! Oh, and here’s one of those small Southern world stories—up on the balcony at City Grocery Friday afternoon, I met this beautiful woman sitting next to our group, and it turns out she’s Kimberly Kountouris Nelson… her father owns the Mayflower Café, a favorite downtown restaurant in my home town, Jackson, Mississippi. And Kimberly grew up Greek Orthodox, so she and Daphne (who is also Greek Orthodox) and I had to chat about Orthodoxy for a while. (and pose for Doug, who had my camera again) Kimberly’s grandparents lived on the same street as mine, in West Jackson back in the 1950s. Here we are fifty years later, (well, only thirty-something years later for Kimberly! )and we both still recognize those common tribes from our very separate childhoods. Kimberly grew up in the Greek Orthodox Church, while I was raised Presbyterian. And of course my spiritual journey, which I’m writing about in my memoir, chronicles several decades of searching, finding, and learning to live with joy within the Antiochian Orthodox Church. So, now for the rest of the photos. Well, not all of them. Some things that happen in Oxford should always stay in Oxford! Enjoy! Author Jere Hoar, one of last year’s workshop faculty, dropped by City Grocery for drinks with us on Friday, and to catch up with Scott, since Scott moved away from Oxford to California last year. Jere always has time to hang out with fledgling writers and encourage us on our journeys. Jere’s books include The Hit and Body Parts. He and Daphne share a moment here. Dan enjoys the view and the conversation up on the balcony. Aubrey and Scott chatting with Dan in the background. Doug reading another one of his terrific stories at open mic. Catching up with Michelle, from last year’s workshop, for dinner on Saturday night. Workshop participants were joined on campus by 10,000 fans who were in town for the baseball tournament. The workshop was held at The Depot, a popular parking spot for ball game fans. So, barricades were set out to reserve our parking spaces each day. No attention to detail was spared! Many, many thanks to our amazing workshop leader, Neal Walsh! (captured during the panel with Ace and Sott) Can’t wait ’til next year!